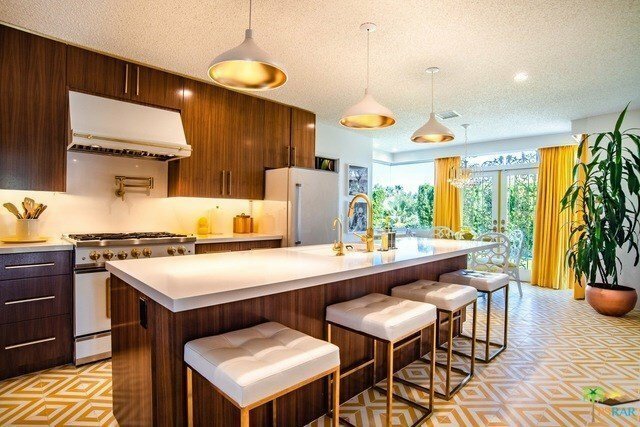 Originally built in 1969, this Hollywood Regency ONE OF A KIND Time Capsule captures your heart, mind and soul upon entering this Twin Palms Estate of a different era. Meticulously maintained and restored , there is NO detail left undone. This home's grand entry and den space , for example, include vintage velvet flocked wallpaper, and colorful shag carpets, while the master bedroom and bath are bathed in exotic hues of pink, reminiscent of Elvis himself. Recent upgrades to the homes amenities and visage tastefully contrast the otherwise Time Capsule-Like appearance , such as exotic Hand Painted Moroccan tile flooring in the kitchen, Ceasar-stone countertops that compliment the cool toned cabinets and newer gourmet vintage appearing high end appliances in the kitchen. The property's exterior exhibits the best of the midcentury modern design period featuring vibrant white rock , lush flowerbeds, recently renovated pool & spa, with a 15 ft Mature Ficus Trees and lush hedges .